Email marketing is simple, but hard to execute properly. Most of the time, marketers blindly do what they are used to without realizing that there are more effective ways to use email marketing. Stop for a moment and think about the last email you sent from your email marketing software. I’m 99.99% sure that you call that email a newsletter. And I’m 99.99% sure that the contents of that email have something to do about your current promos or events. Did I get that right? If I did, read on. If not, you’re most likely using email marketing effectively. Before proceeding, I’d like to take this chance to say that this post is all about ineffective email marketing. I wrote another post on email marketing malpractices or illegal ways people use email marketing. I highly recommend reading that too. You might be doing those email marketing tactics but aren’t aware that they’re illegal. Now that that’s out of the way, here’s a list of ineffective ways marketers use email marketing. They are not bringing in results to your organization. This is the primary reason why they are ineffective. Sending newsletters is a given in any organization that uses email marketing. Most of the time, this is sent at least once a month. There’s absolutely nothing wrong with this. In fact, this is better than not sending any emails to your prospects and customers at all. Studies have shown that it’s better to send an email at least every 2-4 weeks. This allows you to “stay top of mind” with your prospects and customers. But if this is the only email type you’re sending, you’re not using email marketing fully. There are 12 different email types. And using only one puts you at a disadvantage. Newsletters originally came from company bulletin boards. If you aren’t aware, these are spaces intended for posting of public messages, awards, and other memos. Then, when organizations started using email, information was disseminated through the company mailing list. See, before the internet, email was only used by employees. Thus, the company newsletter. When the internet arrived, marketers adopted this mass broadcasting of information. In the early days of digital marketing, newsletters were used to summarize blog posts, company announcements, and events that happened to keep the public informed and up-to-date. However, with the rise of eCommerce — especially the group buying and flash sale sites — the newsletter has lost its true purpose. It has become a way to advertise sales and promos. Be careful when you use this tactic. If you do not consider your message carefully, you will only end up sending irrelevant content to your email list. The call-to-action is to join the newsletter. After joining, here’s the only thing I received from them. Everyday it’s about a sale. It’s about them getting something from me. When people subscribe to a newsletter, they expect content. Take a look at some of the organizations that do this well. Both send at different intervals. 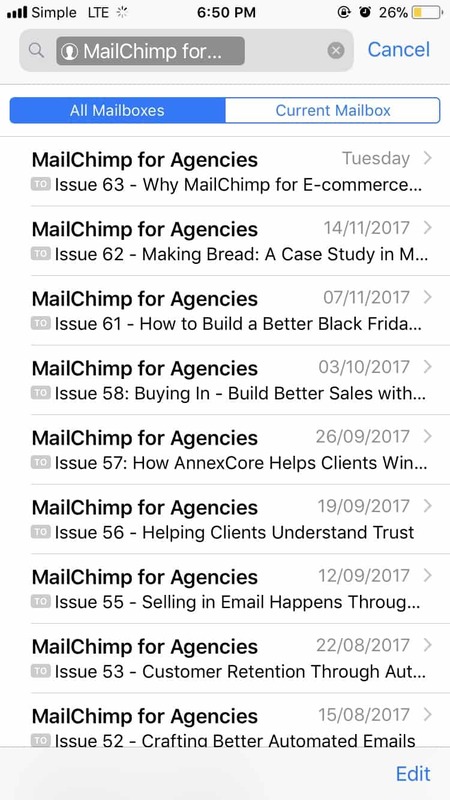 MailChimp – once a week; while WordStream is daily. Do you see anything sales related? 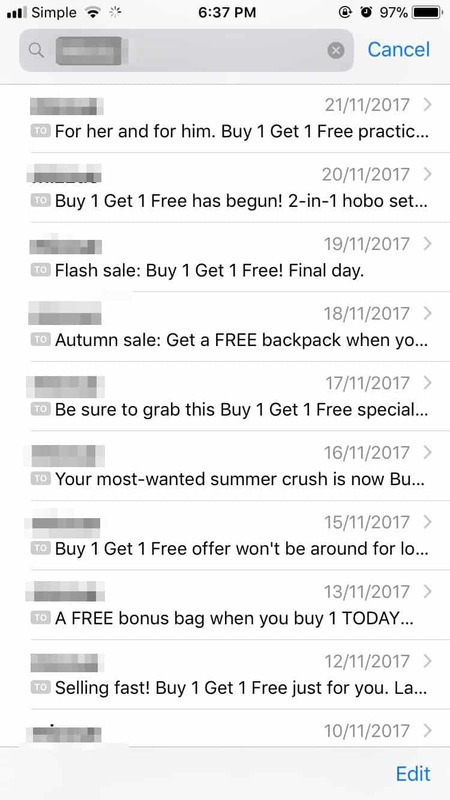 The emails were all about me getting something from them. Not the other way around. That’s also the biggest reason I read them all because it helps me grow. I learn from it. That’s why I keep using these services. Auto-responders fall under the transactional category of emails. They are sent only after a certain action by someone. Most common uses of auto-responders are a reset password email and a confirmation email. If your organization is not using this, you are missing out on developing that relationship with your audience. Auto-responders have the highest open rate among all types of emails. If you want to communicate something, this is the email to use. 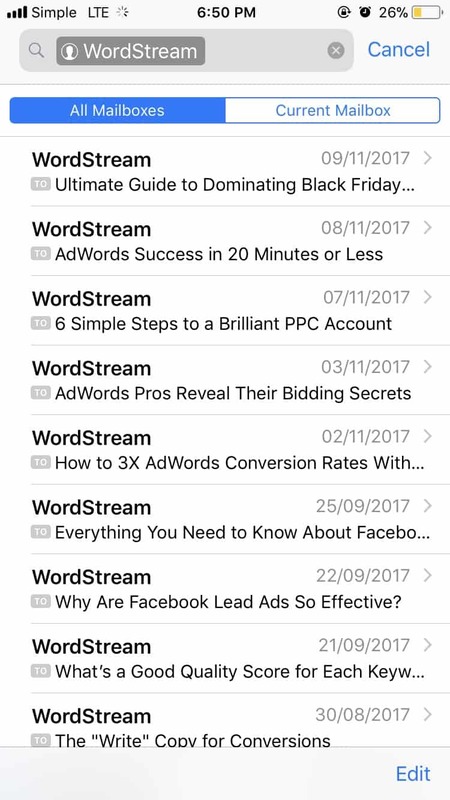 If you’re using marketing offers (aka lead magnets), you should have a confirmation email that supports the message in your thank you page. Segmenting your list is one of the components of effective lead management. Segmenting means categorizing the people in your database based on certain criteria and/or behaviors. If you subscribed to a blog, what is the message you’d expect to get from that organization? Content from their blog, right? But this isn’t the case. Most of the time, organizations send promotional emails disguised as newsletters. This creates a cognitive dissonance in your audience. These nuances add up. Different people have different thresholds. Once you go over that limit, you lose that person forever. For example, you have a customer who just bought an item at a regular price. If you are not segmenting your list, you could end up sending a promo for the same item to the person who just bought at a regular price. You’d end up disappointing that new customer. Albeit small, that person might not buy from you at regular prices anymore. A proper lead nurturing strategy is essential if you want to succeed in email marketing. An effective nurture strategy has one goal — to move that person from one stage in the funnel to the next. Once someone enters a specific segment, that person should be sent automated emails that moves them to the next stage. Without a cohesive strategy to manage your leads, you will end up failing in email marketing. Let’s say you attended an event. You gave out dog treats in exchange for the person’s email. When you get back to your office the next day, you added everything to your email marketing software. Then, send them your on-going promotions. If you’re thinking that’s the right thing to do, you’re not thinking long-term. You’re violating the primary goal of lead nurturing. The first thing you should send is a thank you email. Next, you should send them more info about your company, what you do, what makes you different, etc. This warms up the lead. It “reminds” them who you are. It shows that you care about them, not just their money. It’s no wonder a lot of marketers say their email marketing isn’t working. Sending sales-y messages isn’t wrong. But it should not be the only thing you send out from your email marketing. Almost everyone is doing that. If you want to stand out, it’s really easy. Stop sending these sales messages. Create helpful content. Send them to relevant segments. Focus on adding value through education.